OTTAWA - A new poll suggests the New Democrats are widening their support across the country. 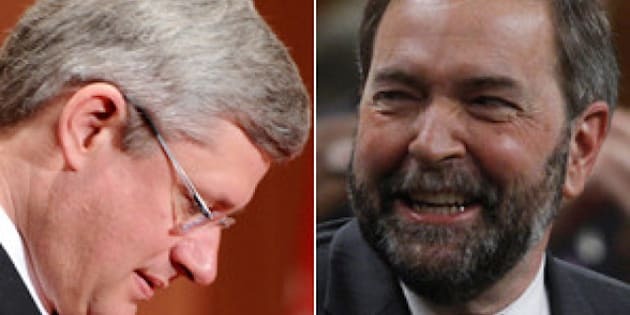 The Canadian Press Harris Decima survey indicates that the NDP have 34 per cent of popular support, compared to 30 per cent for the Conservatives. Still, the poll indicates that the New Democrats have become competitive in traditional Tory areas. Among rural Canadians, the poll suggests the New Democrats have 31 per cent support, compared to 35 per cent for the Tories. The NDP appear to have the support of 36 per cent of urban and suburban men, a number that has risen steadily since February. Meanwhile, the Conservatives are seeing their support in that demographic appear to hover around 29 per cent, down from close to 40 per cent four months ago. As well, the New Democrats appear to have supplanted the Liberals as the natural party among women, said Allan Gregg, chairman of Harris Decima. "Remember this is a party that a decade ago, half the electorate said they would "never" vote for," he said. "To broaden their base as we see in these data is quite remarkable." Overall, the Liberals continue to hold steady at 20 per cent support, the poll suggests. Just over 2,000 Canadians were polled for the survey in the last week of April and first week of May. The period marked ongoing controversy of the price tag for fighter jets as well as the introduction of the Conservatives' controversial omnibus budget implementation bill. But it also saw the anniversary of the 2011 federal election which returned the Conservatives with their majority government. The election resulted in the NDP surge into Opposition status thanks to a record number of MPs being elected in Quebec. In that province, the party's fortunes appear to be sliding following a spike after the election of new leader Tom Mulcair.